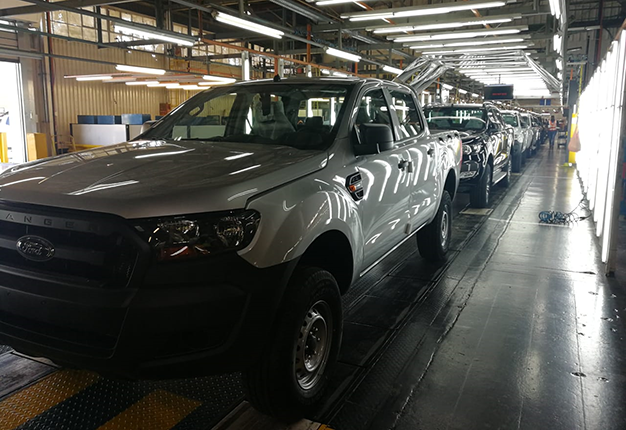 Ford’s Silverton Assembly in Pretoria has undergone an extensive transformation in preparation for the start of production of its 2019 vehicle range, comprising the highly anticipated new Ford Ranger Raptor as well as the new Ranger and Everest. 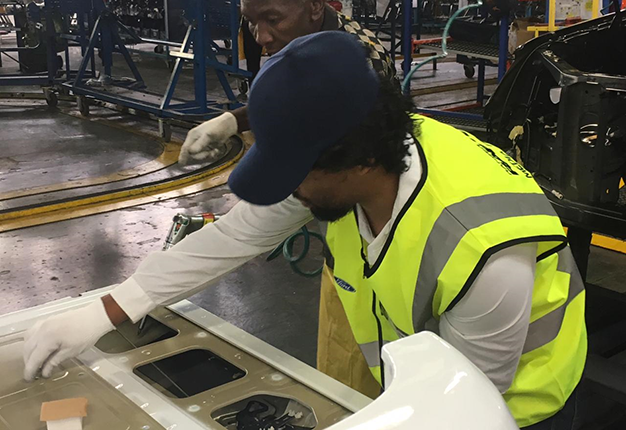 Having benefitted from an investment of almost R3-billion to expand its installed capacity of up to 168 000 vehicles per year, a comprehensive programme of upgrades and changes have been implemented at the plant over a period of more than 18 months. "The Silverton Assembly Plant has been transformed to achieve our highest-ever installed capacity," said Ockert Berry, VP of Operations, Ford Middle East and Africa. "This required a total rethink and re-engineering of many of our established production processes and operations throughout the plant to improve throughput, efficiencies and ergonomics to reach the projected production targets. "While gearing the plant up for the higher volumes was a key objective, this had to be managed alongside a significant increase in production complexity associated with the unique characteristics of the Ranger Raptor, the introduction of a new engine programme, and extensive product enhancements planned for the 2019 Ranger and Everest," he added. 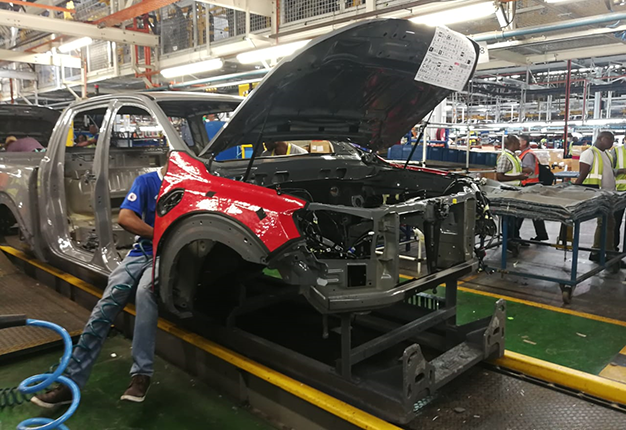 Adding further to the challenge was the requirement for the engineering changes to be implemented without significantly impacting the ongoing production of Ford’s existing models, which are currently assembled at a rate of almost 10 000 vehicles per month for the domestic and export markets. In many cases this was made possible by means of the modular assembly of machines and components at the relevant supplier companies, with just the installation taking place at the Silverton plant. A lot of work was also conducted during the December shut-down period last year. 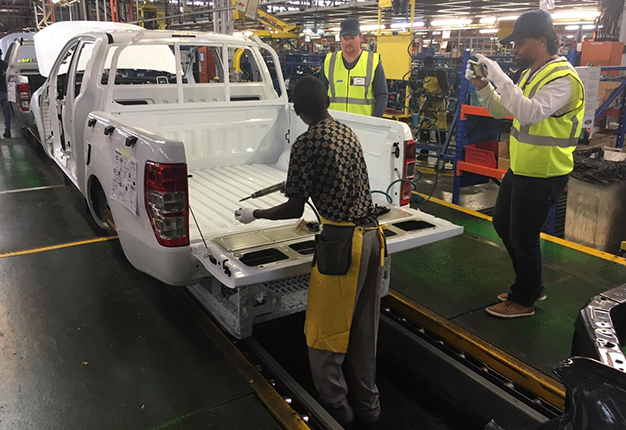 Some of the most noteworthy upgrades were introduced right at the start of the production line with the installation of 25 new robots in the Body Shop for the welding and assembly of the front and rear floors, body sides, cab and rear loadbox. A total of 115 fully automated robots now manage the complex handling and welding of components in conjunction with a mix of robotic and manual weld controllers. Meeting the Body Shop’s requirements for the delivery of higher volumes of body panels was achieved by adding new accumulating conveyor buffer systems, with capacity increases almost doubled for most of the stations – including a completely new triple-decker layout for the underbody conveyor. "Commencing with the assembly process, in order to meet global manufacturing requirements and volume demands, we introduced sub-assembly zones for numerous areas on the line so that a lot of the preparation work is done by the time the parts are fitted to the chassis or body of the vehicle. "We now have sub-assembly lines for the engines, suspension, axles and doors," Berry explains. 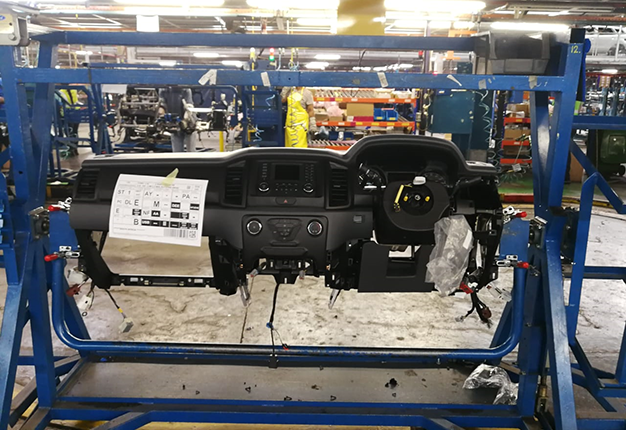 The doors are removed from the vehicle at the start of the line, and diverted onto a completely separate, all-new line where the electrical components and switches, rubbers, windows and trim panels are fitted. This enables the assembly process for the interior of the vehicle to happen simultaneously, thus dramatically speeding up the process. The “doors off” system also allows easy access to the cabin of the vehicle, enabling easier fitment of the wiring harness, carpets and roof lining, as well as the bulkier items such as the dashboard and seats. On the topic of seats, an innovative new conveyor system was installed that offloads the seats outside the building, places them on a conveyer system that transports the seats through the roof of the plant and delivers them to the vehicle assembly line for fitment to the near-complete body. This process creates its own buffer system, and alleviates traffic congestion in the plant. The chassis line also underwent a complete overhaul. Where the plant previously relied on a turning fixture at the start the line to turn the chassis upside down for easier fitment of the suspension and axle components, the chassis is now delivered to the line already inverted. This saves time and frees up space for the expansion from 13 to 29 stations, leaving only one turning fixture further down the line. The front and rear suspension struts arrive at the main chassis line having already been assembled in new dedicated sub-assembly areas, making it a simple process of bolting the units into place. A new monorail conveyor system was added to transport the axles, which are pre-assembled off-line, through to the chassis line, and this was engineered to accommodate the standard units fitted to the normal Ranger and Everest, as well as the beefed-up, wider versions that are used on the Ranger Raptor. Similarly, the pedestals that carry the chassis along the production line had to be re-engineered to fit both Ranger configurations. The Ranger Raptor features a reinforced chassis supported by completely different front and rear suspension compared to the standard Ranger. Up front this unique Ford Performance model is equipped with heavy-duty springs and sturdy aluminium upper and lower control arms in place of the welded steel units of the standard Ranger. At the rear, the Ranger Raptor features a multi-link solid rear axle with Watt’s linkage that has more in common with the set-up employed on the Everest than the normal Ranger. Combine that with motorsport-derived Position Sensitive Damping FOX Shocks on all four corners, plus huge ventilated disc brakes all-round, and it becomes clear how different the ground-breaking Ranger Raptor is relative to its siblings. 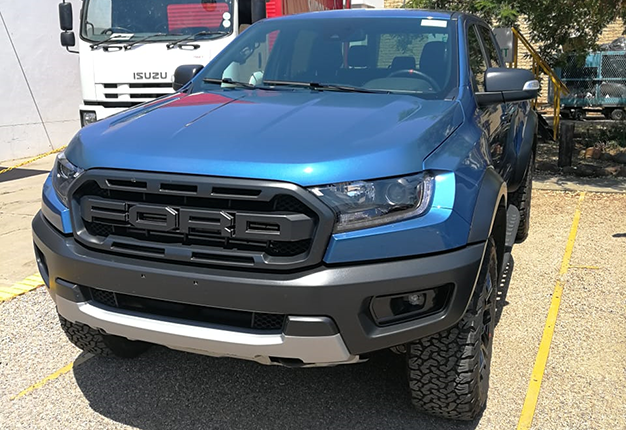 "Accommodating the Ranger Raptor’s long-travel suspension, 150mm wider track, 168mm wider body and much bigger tyres required significant upgrades at numerous points along the assembly line," Berry states. "There are around 350 parts that are unique to the Ranger Raptor, which adds a lot of complexity to the line." One of the biggest updates for the 2019 Ford Ranger and Everest will be the launch of the new-generation four-cylinder turbodiesel engines, including the advanced 157kW Bi-Turbo unit that will power the Ranger Raptor and selected Ranger and Everest models. The existing Duratorq TDCi engines, in 2.2-litre four-cylinder and 3.2-litre five-cylinder guises, are also fitted on the assembly line. Accordingly, with the added engine derivatives and increased volumes, a new engine line was installed, incorporating a new floor conveyor system with additional stations. Here the engine ancillaries, such as the alternator, air-conditioner, drive belts and engine mounts are fitted, followed by the gearbox, prior to installation on the chassis in order to speed up the production process. The chassis line also had to be adapted for the addition of Ford’s new 10-speed automatic gearbox that will be introduced with the new Bi-Turbo engines, along with the carry-over six-speed automatic, and the five and six-speed manual transmissions used on various models. "Upgrading the Silverton Assembly Plant has been a monumental task spanning more than a year and a half. It has truly pushed our engineering and production teams to come up with innovative and creative solutions. 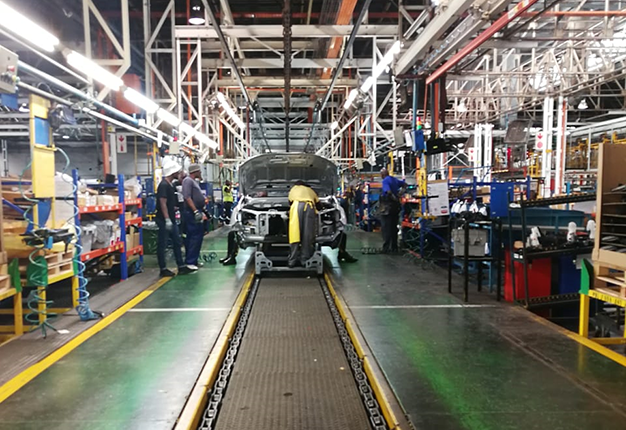 But we are now ready to begin a new chapter for Ford in South Africa as we create new opportunities with our highest-ever assembly capacity, with an expanded model range that drives quality in all areas," Berry concludes. Nissan to build next-gen Navara in SA: Could more bakkies be built locally? The next Navara will roll off Nissan's new assembly line in Rosslyn, Pretoria in 2021. Could three more bakkies also be built there? Land Rover’s all-new Discovery has arrived in South Africa with prices from a fraction less than R1-million. Check out details for the new Disco! From the demanding Nurburgring circuit to the deserts of the Middle East, Jaguar is testing its new E-Pace. The test unit gives us a better look at the upcoming SUV.